Per le librerie e le biblioteche: sconti particolari dedicati alle categorie, basta farne richiesta a info@libellulaedizioni.com fornendo i relativi dati. Studenti: 20% su Lr1 e Lr2 e 25% se acquistati entrambi per procedere all’acquisto INVIA UNA MAIL a info@libellulaedizioni.com con il numero di matricola, riceverà subito un codice coupon di sconto da inserire all’acquisto. Per docenti: 10% di sconto che verranno applicati al momento della fatturazione. ELR – European Legal Roots – is a network of Roman law scholars and legal historians, founded as a vehicle for increasing communication and cooperation among universities, scientific institutions, and individuals working on related topics in Europe and beyond. ELR embraces the wide variety of legal disciplines and languages represented by its participants. These serve both as a fertile ground of research and as an opportunity for the exchange of ideas. A critical aim is to develop the tradition of law and legal history in Europe into an object of study that more clearly reflects and articulates both the more specific and the more diffuse cultural identities and legal backgrounds of its participants. One area of particular interest in this regard is the interface between common law and civil law systems. 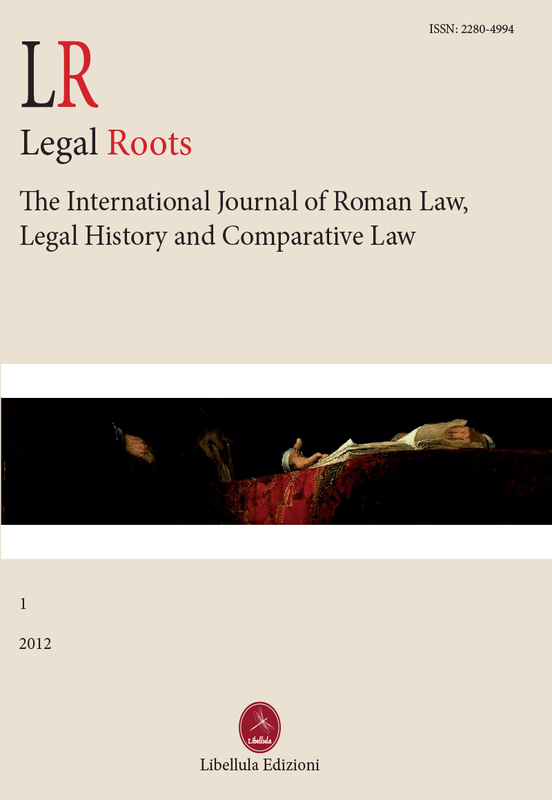 ELR also sponsors the journal LR – Legal Roots. The primary goal is to promote the diffusion of scholarship in the fields of Roman law, legal history, and comparative law, by encouraging research and even debate in these areas. Legal Roots (LR) takes its point of departure from the consideration that while traditionally law and state have been inseparable in the sense that the boundaries of the latter have determined the sphere of application of the former, the rise of the European Community with its supranational powers of regulation has called this model into question, certainly in Europe. The EC has without doubt established itself as a new political and institutional reality. This means that “Europe” is no longer merely a geographical designation, but instead possesses a fully formed governmental entity, with its own legislative, executive, and judicial branches, capable of passing, interpreting, and enforcing its norms. A constantly growing bureaucracy supports the work of these three branches. The precise nature and full extent of the EC’s sovereignty is still under development, of course. These facts pose great challenges to students, practitioners, and ordinary citizens alike, especially as they confront the problem of the relationship between the norms of the EC’s member states with the norms of the EC itself. To what extent, for example, are the former expected to yield to the latter? Such challenges, in part because they appear to be without precedent, have raised certain difficulties that go beyond the legal and political issues of the moment. They also assume a certain historical and cultural significance. Here is where LR – and the entire ELR project – finds its place. These apparently novel developments are not in fact entirely new. Instead they have deep roots, tracing their origins to the experience of the Romans in both a political and legal sense. Another source of reflection is the contemporary culture(s) of countries with common law jurisdictions, especially, but not exclusively, England, the US, and Australia. Their complexity reminds us that we learn little from looking at any one legal system in isolation, apart from its political system or economy, for example, or without reference to other legal systems for points of comparison. This remains true whether our primary focus is ancient Rome, modern Europe, or the world beyond. ELR is poised to take on all three. Con la pubblicazione di questo primo volume presentiamo alla comunità scientifica la Rivista internazionale Legal Roots, The International Journal of Roman Law, Legal History and Comparative Law. LR ospiterà scritti, referati in “doppio cieco”, di diritto romano, storia giuridica, diritto positivo, diritto comparato, teoria e filosofia del diritto. Saranno inoltre pubblicati saggi in materie che variamente si intersecano con lo studio delle radici giuridiche europee ed extraeuropee, guardando alla storia politica, economica e sociale dell’antichità e delle epoche successive. Questa nuova iniziativa editoriale tende così a collocarsi in una prospettiva multidisciplinare, in cui ciascun autore possa proporre i frutti delle proprie ricerche, nel rispetto della sua metodologia di riferimento, ma sentendosi partecipe della costruzione di quel comune denominatore culturale che abbiamo individuato evocativamente nelle “radici”: le radici giuridiche dei sistemi normativi moderni, ma anche le radici, più in generale, della nostra civiltà, della nostra cultura, del divenire della nostra modernità. LR si presenta così come un segmento del più generale progetto ELR, European Legal Roots, Network tematico che connette, ad oggi, studiosi di venticinque paesi del mondo e che già pubblica online nel nostro sito web notizie, strumenti di lavoro, cronache di convegni.